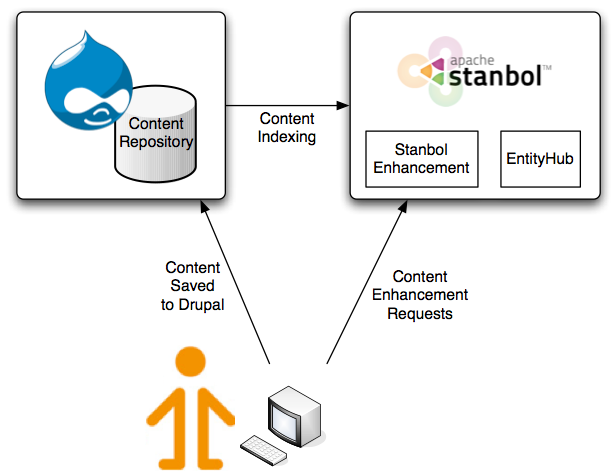 For leveraging Apache Stanbol with Drupal we send Drupal’s data over to Apache Stanbol’s EntityHub component for indexing, such that it is available to Apache Stanbol’s content enhancer. That means, we can use VIE widgets like annotate.js to send pieces of text over to Apache Stanbol for auto-linking content items indexed to Stanbol, which by default includes DBpedia entities, but could be easily extended by any source providing data in RDF. Next, the VIE autocomplete widget allows for easy tagging based upon entities indexed with Apache Stanbol - regardless of whether they come from DBPedia or from one of the Drupal sites your organization runs! Initially, the plan was to use JSON-LD for sending Drupal’s content over to Apache Stanbol. However, while VIE.js makes heavy use of JSON-LD, Apache Stanbol does not (yet) support JSON-LD when indexing data in its EntityHub component (it does for sending back the text annotation results though). Thus, we used RDF/XML generated by the RDFx module to communicate with Apache Stanbol’s Entityhub. For easy indexing, we created the Search API Stanbol module, which leverages the (great!) Search API for that. Together, with an Apache Stanbol install that is pre-configured for Drupal’s use (link) you can get your own Apache Stanbol instance up and running with Drupal in a minute! Checkout scor’s screencast introducing the module! Of course, there is a demo available online also, so you can try it yourself! Head over to the demo page and give it a test! While integrating all this nice stuff we made sure our work is easy to get up running yourself - so it’s easily re-usable and a good start for any further semantic content enhancement adventures with Drupal. So we’ve not only contributed the VIE.js and Apache Stanbol integration modules, but packaged the whole demo site as a Drupal distribution! You can download Drupal with all the modules needed and everything pre-configured out of the box (just as for Apache Stanbol) - just install Drupal as usual, run the pre-configured Apache Stanbol and you’ve the demo running. There’s even a feature module which provides you with default content you can start over with. Check out the IKS Content Enhancement Demo distribution! Of course, you are welcome to use its issue queue for reporting problems or for collaborating on improvements or further features! Holy crap, fago (& the others), that's brilliant. I guess to fully grasp the potential, some extended "killer app" application would help. In the meantime, why not move the screencast to the top of the article, having seen the results first makes the details much more understandable. Thanks for this great idea and post!